Sold in July 2016, the 33.83 metre motor yacht Seychelle is back on the market, listed for sale by Neal Esterly at Fraser. Designed by Jack Sarin, she was built in GRP by US yard Northcoast and delivered in 1993. A neutral interior by Patty Bennett uses honey oak joinery and accommodates 10 guests in five cabins consisting of a master suite behind the pilothouse, a VIP suite and three doubles, all with entertainment centres, television screens and en suite bathroom facilities. 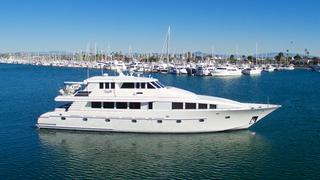 In addition, there are quarters for four crew in two cabins aboard this yacht for sale. The full beam saloon has settees to port and starboard in light coloured fabrics, along with tan carpeting, coffee and end tables, lamps and accessories. The entertainment centre, including a KVH satellite television screen, is oriented at a 45 degree angle to face port aft. Four large windows on each side and glass doors aft give exceptional light throughout the area. Forward is a formal dining area at a glass topped table and seating for six guests along with oak cabinets for storage of crockery and silverware. Further forward still is a country kitchen style galley with dinette seating up to 12 guests for casual snacks throughout the day. For added convenience, there is a wet bar forward with two stools. The pilothouse has a helm station forward while an L-­shaped settee is located in the aft port corner with a wet bar to starboard, making it the perfect place to sip a cool cocktail while enjoying the panoramic views. Twin 1,450hp Detroit Diesel engines give her a cruising speed of 11 knots and a range of 2,000 nautical miles. Lying in San Diego, California, Seychelle is asking $2,950,000.